Clarence Thomas asked a question from the bench to defend gun rights. 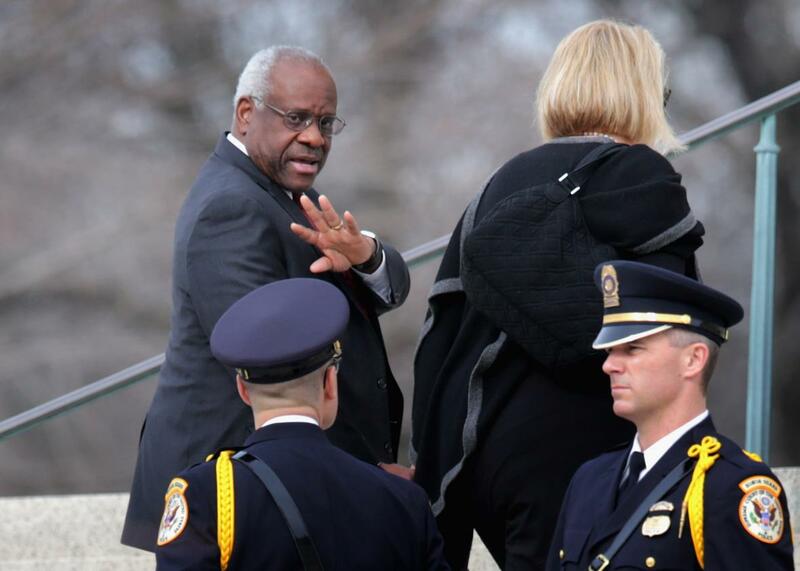 Supreme Court Justice Clarence Thomas, pictured on Feb. 20 in Washington, D.C., asked his first question from the bench in a decade on Monday. On Monday morning, the Supreme Court heard oral arguments in Voisine v. United States, a complex and arcane case involving domestic violence and gun ownership. The case initially seemed to revolve around a technical question of criminal intent. Stephen Voisine was convicted of “intentionally, knowingly, or recklessly caus[ing] bodily injury or offensive physical contact” to his girlfriend following a domestic dispute. As a result, he was stripped of his ability to own a gun, because United States federal law indefinitely bars individuals convicted of “a misdemeanor crime of domestic violence” from owning firearms. Voisine now argues that “recklessly” causing violence—as opposed to knowingly or intentionally—shouldn’t disqualify him from possessing a gun under federal law. Thomas’ line of questioning completely reversed the court’s apparent view of the case. Before he spoke up, Voisine seemed likely to lose, as a majority of the justices poked holes in his complicated argument over recklessness. After Thomas’ questions, at least one liberal—Breyer—appeared somewhat enticed by the proposition that the court could rule in Voisine’s favor to avoid opening the Pandora’s box that is the Second Amendment. It was a powerful, startling moment, made all the more fascinating by the mystery of Thomas’ motivation: Why now? Is the justice representing the position he knew Scalia would fiercely defend? Is he simply tired of remaining a bystander during arguments before his own court? Either way, the exchange provided a reminder that Thomas’ reticence over the past decade has prevented us from getting a deeper glimpse into his idiosyncratic passions. With any luck, he’ll keep talking.